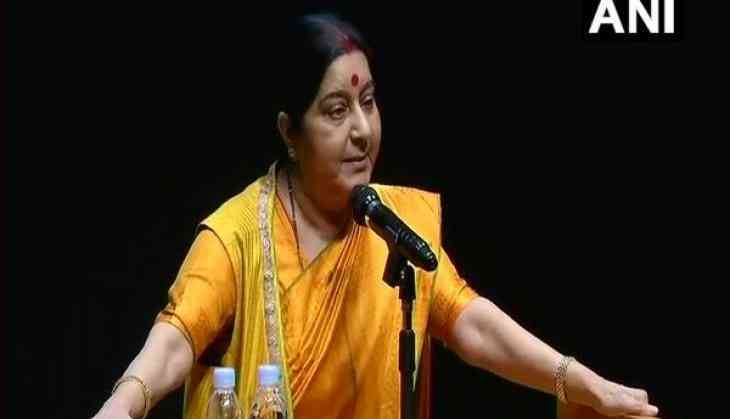 External Affairs Minister (EAM) Sushma Swaraj on Thursday said relations between India and Japan have strengthened under the leadership of Prime Minister Narendra Modi. Addressing the gathering of Indian Diaspora at the Vivekanand Cultural Centre here, the EAM also lauded the contribution of the diaspora for strengthening the bond with Japan and creating a positive image about India in Japan. "India-Japan relations are stronger than before, a major reason for this is Prime Minister Modi's and Prime Minister Shinzo Abe's friendship. India's relations with Japan have strengthened under the leadership of PM," Swaraj said. Swaraj reached Tokyo on Wednesday to attend the ninth India-Japan Strategic Dialogue with Japanese Foreign Minister Taro Kono. The strategic dialogue between Swaraj and Kono is scheduled to take place today. Swaraj is on a three-day visit to Tokyo from 28-30 March 2018. As per an official release by the Ministry of External Affairs (MEA), the two sides will review all aspects of bilateral relations and exchange views on regional and international issues of common interest. The MEA further said that the visit of Japanese Prime Minister to India in 2017 gave 'fresh impetus' to the bilateral ties between the two countries.